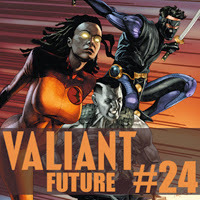 In this episode of Valiant Future Joe and Paul discuss the conclusion to the Armor Hunters event and a string of recent announcements from Valiant Entertainment. Plus, listen to win a copy of the new Valiant role-playing game! Valiant Future - Harbinger: Omegas #2, The Delinquents #2, Death-Defying Doctor Mirage #2, Bloodshot #24, Armor Hunters: Bloodshot #3, Unity #11, Armor Hunters #4, X-O Manowar #29, Armor Hunters: Aftermath #1, and X-O Manowar #0.